I am so excited. 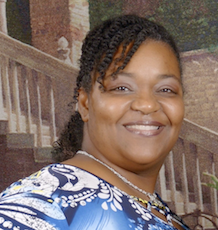 I have been playing around with My Digital Studio (MDS) and this is what I have created. These are inserts for the Empty Clear Stamp Storage Cases (DVD Cases). 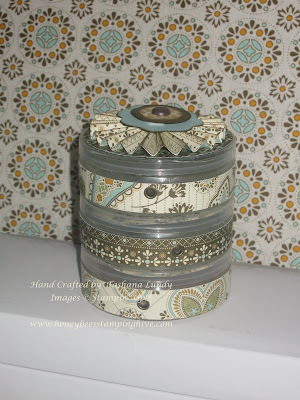 Janet over at Remarkably Created has a step by step video tutorial. I only have one problem....I can't choose which design I like best. Today starts Sale - A - Bration. For every $50 you spend on Stampin' Up! products (before tax and shipping) you earn one item FREE from the Sale-A-Bration catalog. Yes, I said FREE! 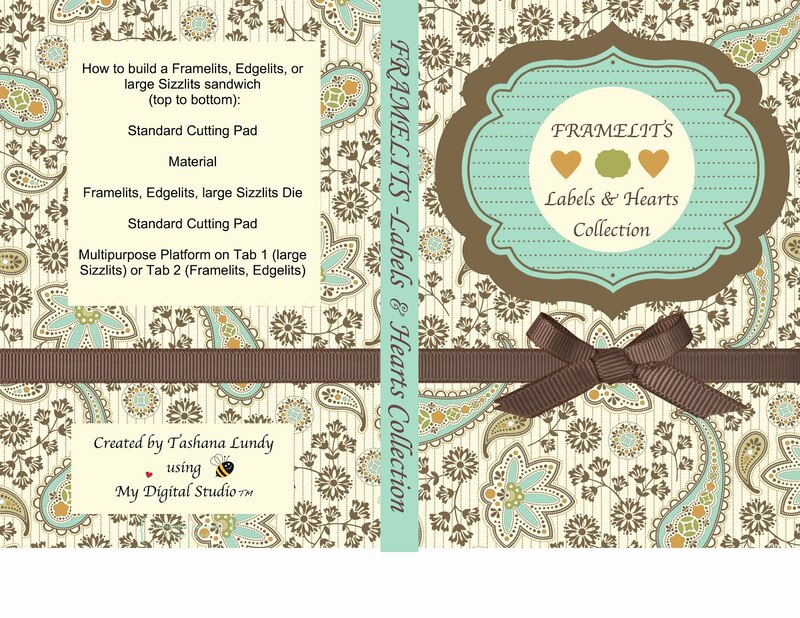 Click on the link to the left to view the complete catalog. 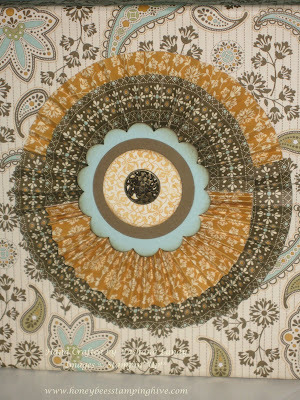 For now, check out the sample below that I made with some of the FREE products. 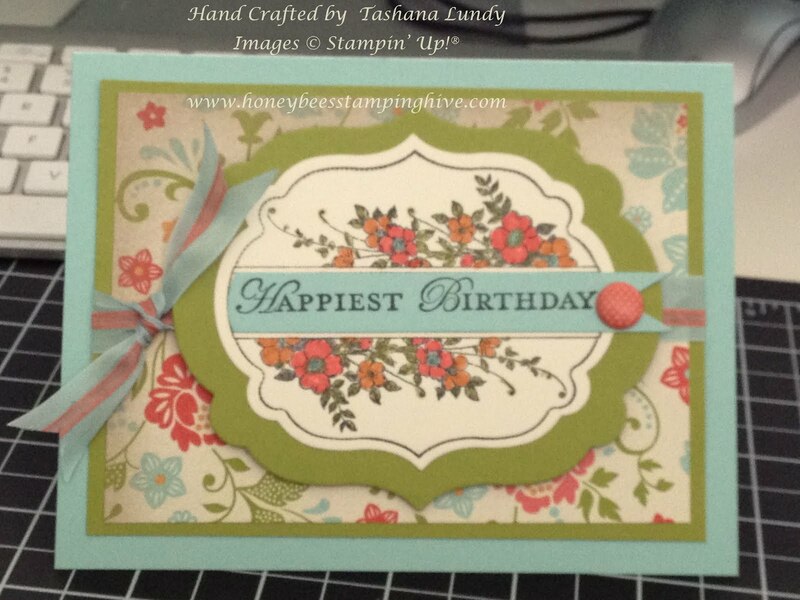 I am in love with the flower from the stamp set Mixed Bunch. It is the Occasions Mini Catalog. I have been playing around with this set for a few days. I will be showing you more projects made with it. Here, I cut 2 petals off the flower to make a butterfly. The Apothecary Art stamp set is becoming one of my favorites. It is so lovely. 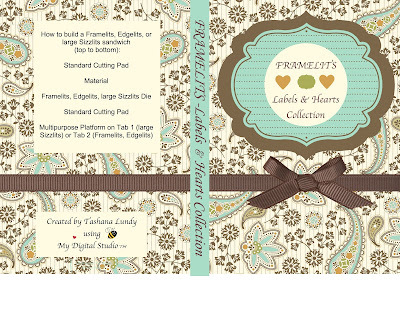 I just love the way it layers with the Labels Framelits Die. I also used the new Heart Textured Impressions Embossing Folder on the Soft Suede card stock. 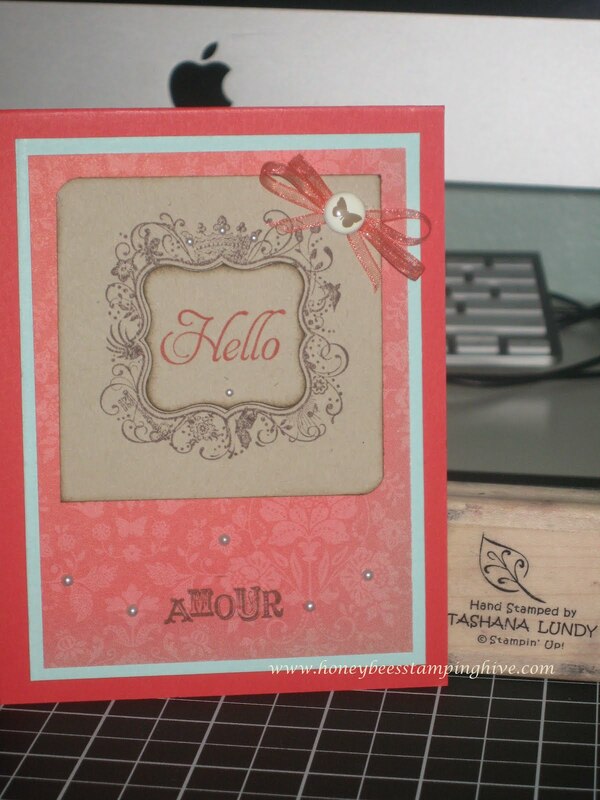 Other supplies: Lucky Limeade, Blushing Bride and Very Vanilla card stock, Everyday Enchantment DSP, Basic Pearls, Oval and Blossom punch, and various Stampin' Write markers. This is the card I made for my dear sister. I used the new Labels Collection Framelits Dies and the Apothecary Art stamp set. 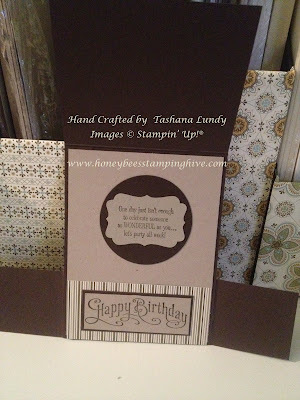 The sentiment was stamped on a strip of Pool Party card stock cut out from the Petal Cone Die and I added a brad from the Designer Printed Brads. For the ribbon I used the Pool Party Seam Binding and Calypso Coral Organdy Ribbon from the Sale-A-Brations catty (starting Jan. 24, 2012). 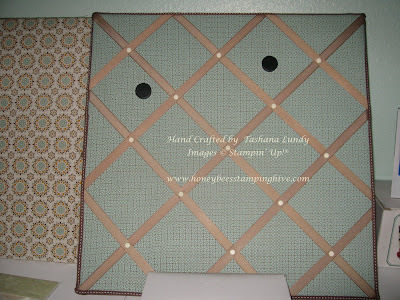 The Everyday Enchantment DSP was layered on Lucky Limeade card stock and Pool Party was used for the base. I just love this card. 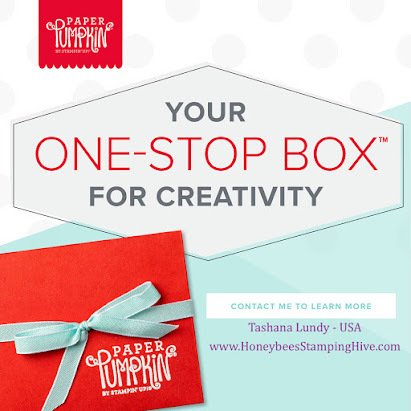 I wanted to share another glimpse into my Stamping Hive. 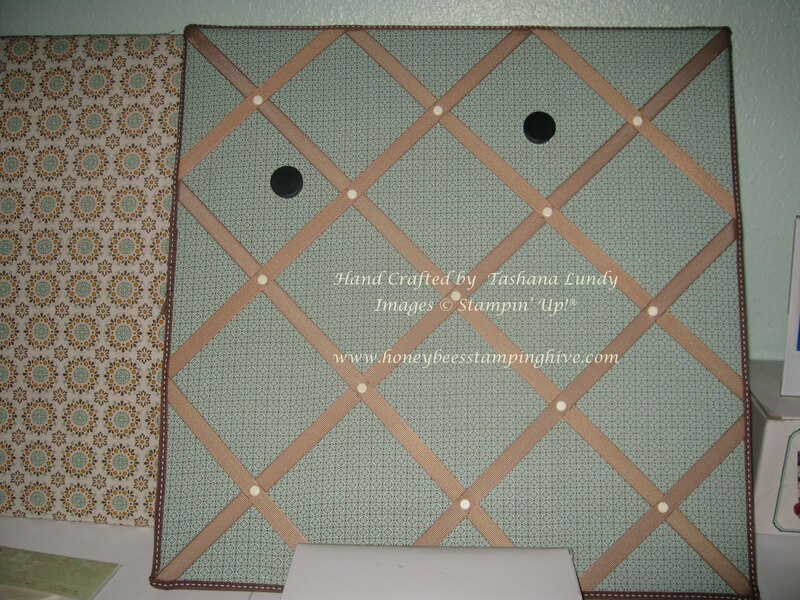 I took this magnetic cork board and covered it with the Spice Cake Fabric. The board was a little larger than I wanted so the fabric did not wrap around the edges very well. As you can see, I covered the edges with ribbon to hide the loose ends. I think it turned out great. This was my first time making a Memory Keeper. I have seen them all over Stampin' Connection and SCS....I just had to try it. 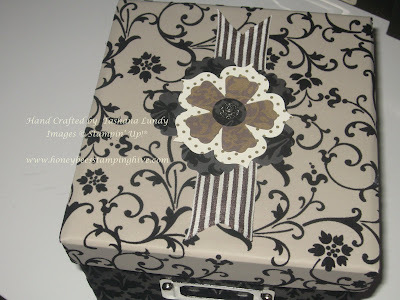 Here is another page from the scrapbook I made for my friend. I CASE'd the design from a card and just made it into a 6x6 page. Allison did a wonderful job on her card. You can view it HERE. I just love elephants and this one is simply adorable. 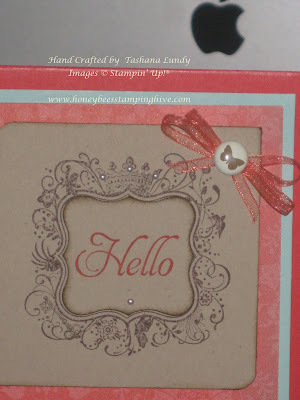 Today I am sharing a 6x6 page I made for a friend. Him and his wife are expecting a baby girl next month. This is going to be the first page of the scrapbook I made for them. I love the color combination and the butterflies are just so cute. This is the card I made for my Wonderful Husband on his birthday. I love the card style and the Mocha Morning DSP is just awesome. 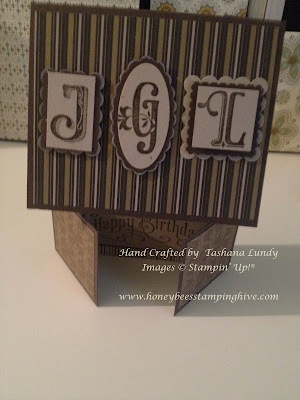 I really like how Stampin' Up! makes everything coordinate so well. 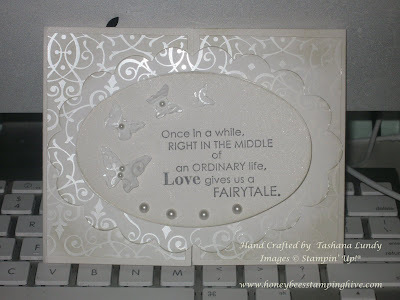 I love stamping but I don't want it to be difficult. 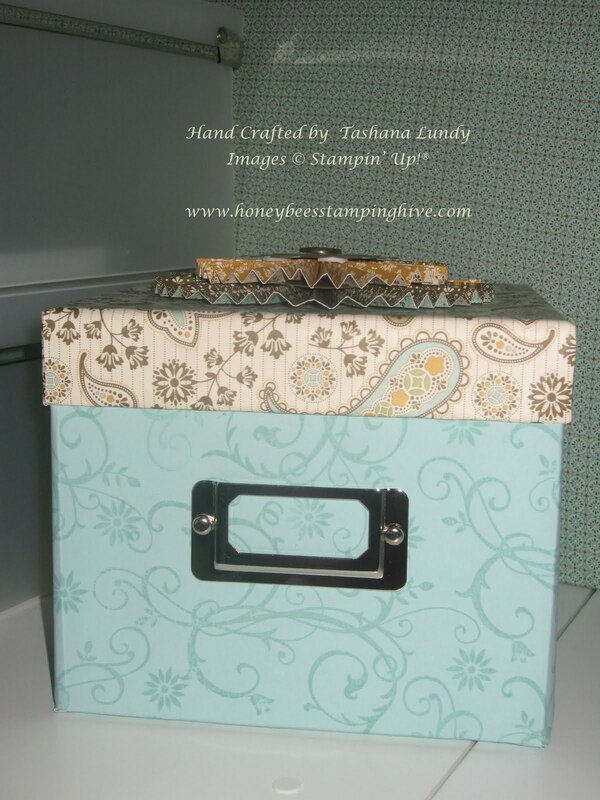 I still haven't completed my Stamping Hive, but it is close to being finished. I started a new term in school this past Monday. 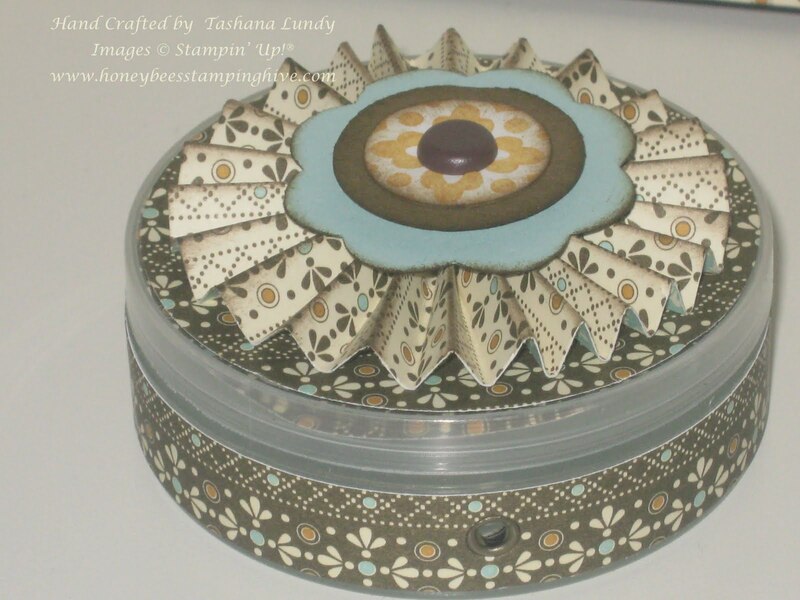 I hope I can keep up with my stamping. 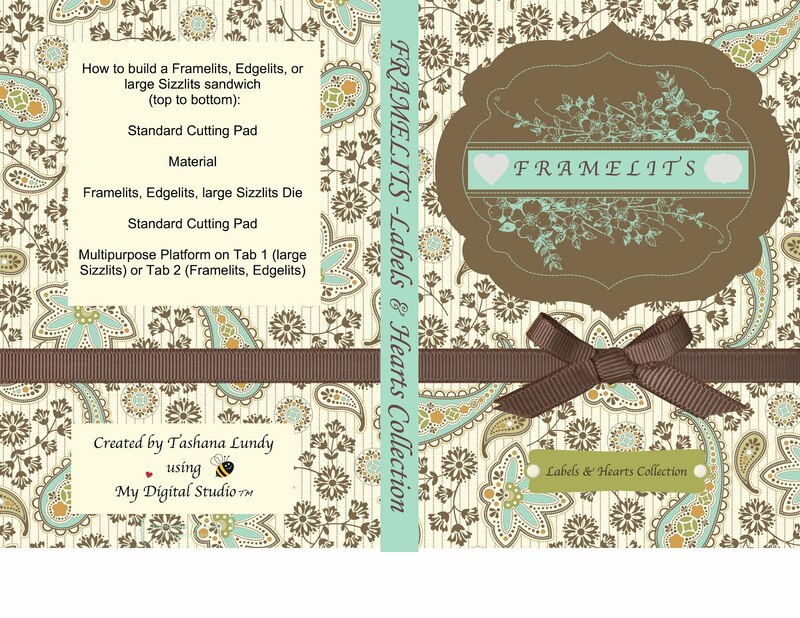 I have an order of the new products from the Occasions Mini Catalog coming in...Today! I will have to make time to play with my goodies and share my projects. 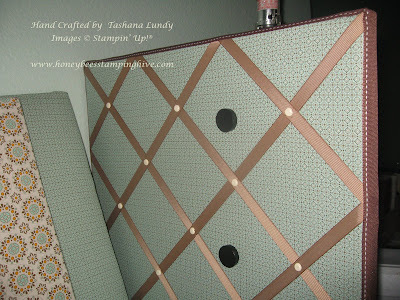 Today I am sharing a project that I seen HERE. I thought this was just the best idea. I love it. 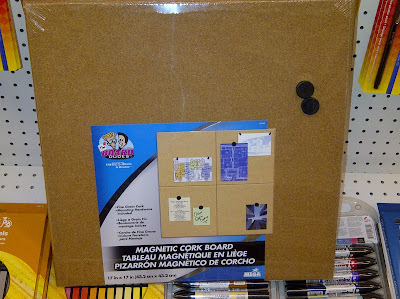 I don't like the fact that the Linen Thread or Bakers Twine comes on the sheet of cardboard. Using these containers are perfect. I hot glued a set of three together. 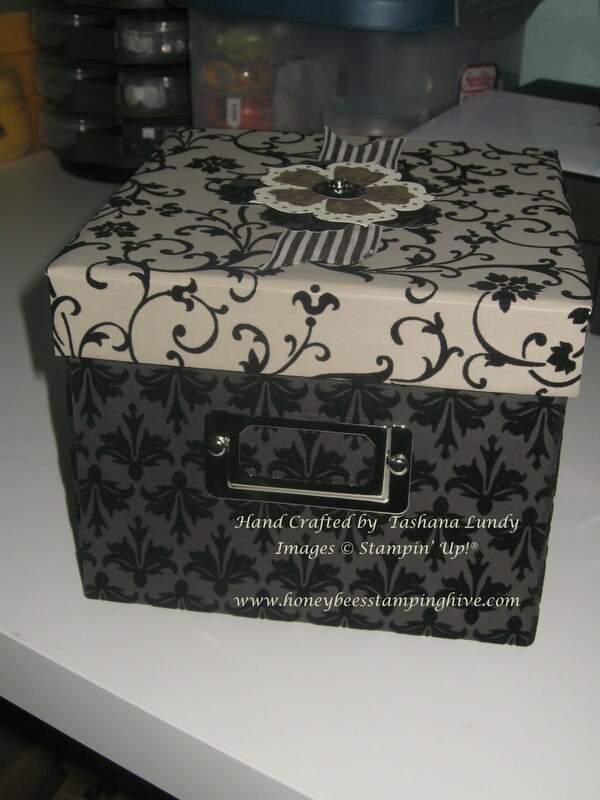 I haven't used up any ribbon yet, so I don't have the middle piece to wrap the twine around. 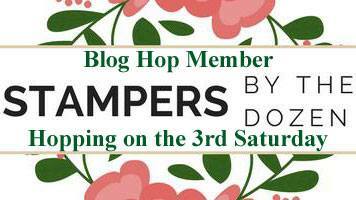 You can find out all the details by clicking the above link and HERE as well. Just a quick post. 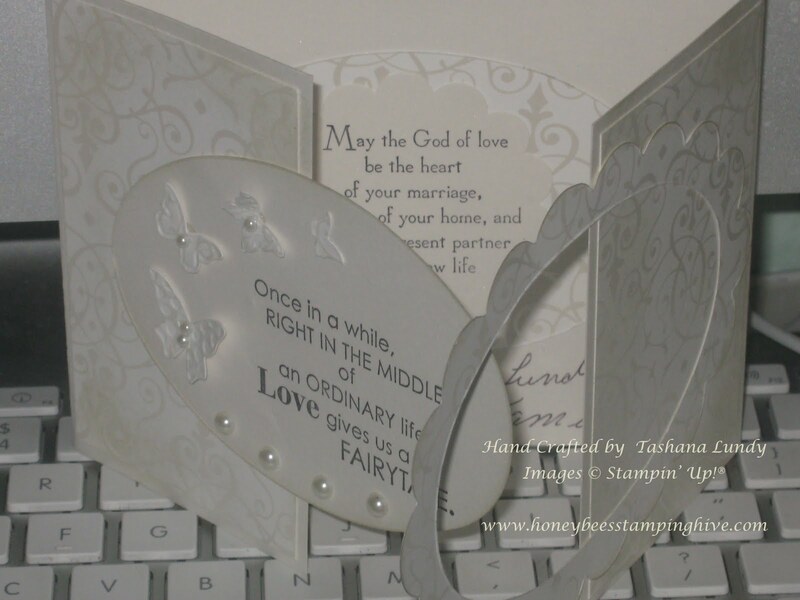 Here is another gate fold wedding card like the one I shared yesterday. 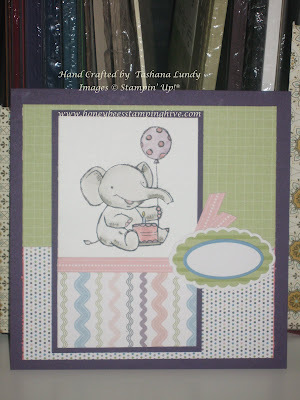 This one I used all Whisper White card stock. 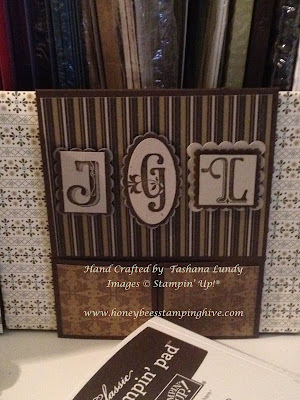 I embossed the panels using the Vintage Wallpaper Embossing Folder. I made this card for my son's 4th grade teacher. She was recently married. Dawn has a video on how to create this type of card. 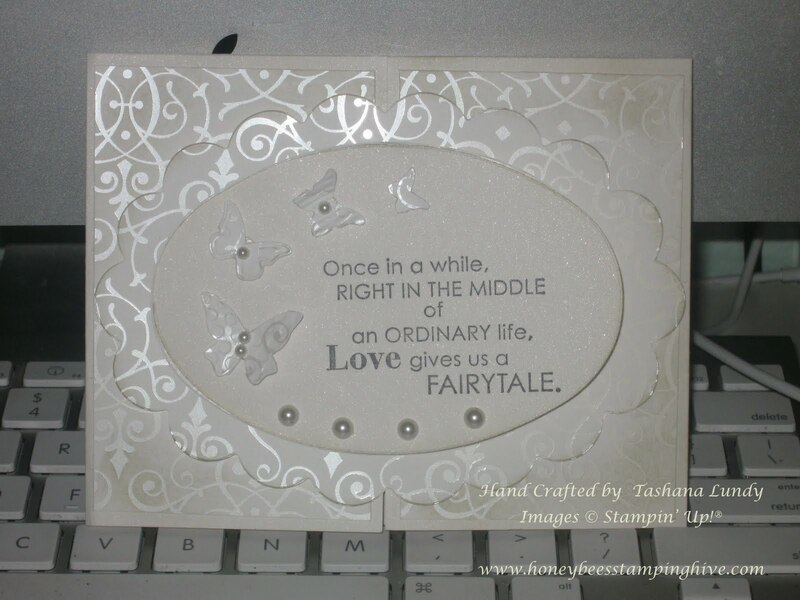 The layout is also from one of her cards. I can't remember the name of the Specialty DSP that I used. I sponged it with River Rock. The base and middle oval is from Shimmery White card stock. 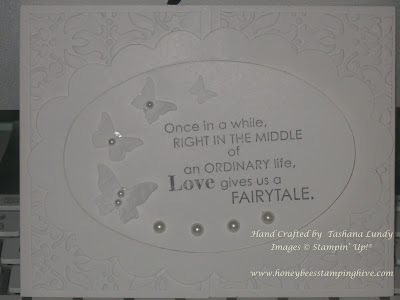 I just love those little butterflies from the Beautiful Wings Embosslit Die.